1. Grind the coconut along with cumin seeds and green chilies to a very fine paste. 2. Cook the vegetables adding ingredients numbered 2 until they are done and the water is almost evaporated. Pour 2 tsp ghee and stir until all the water has evaporated. Add in 3 cups of beaten, sour yoghurt and boil uncovered until the yoghurt thickens, about 10 – 15 minutes at medium heat. Bring down the heat. Add the ground coconut mixture and mix well. Cook for a minute or until it just starts to boil. Check for salt, sprinkle roasted fenugreek powder and remove from stove. 3. Heat coconut oil in a small pan. Splutter the mustard seeds and fry the dry red chilies. 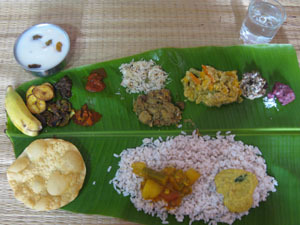 Add in the curry leaves. Saute for a few seconds and pour over the prepared kalan. Cover with a lid for 15 minutes and serve with hot rice. Kalan looks so perfect and yum. Kalan looks wonderfully delicious and mouthwatering. Excellent preparation. A new dish for me..Bet it tastes fantastic with hot steamed rice!! Picture perfect but i ran away from this dish.It never came good for me :(…..
Nice recipe,looks so delicious and yummy. Came across your blog today…..love love love it. Hi Indu, sure, you can just use plantain. Sorry for the late reply! Hope you like this dish! Thank you so much for taking the time to write back here, means a lot to me 🙂 Great to know that you guys enjoy my recipes. Pls keep visiting..
Maya – A big Thank you for all sharing your recipes. I absolutely love your site, you have become my go-to person for recipes!! I have tried many recipes from the site and they all turned out very good! I really like how you put together your recipes complete with beautiful pictures. Wish you all the best!! Thank you so much for your sweet comment, Usha 🙂 Great to know that you enjoy my recipes..